IS YOUR ROOF SAVING OR COSTING YOU MONEY TO OPERATE? With our silicone coating you can be rest assured that your roof will be saving you money and paying for itself through energy savings through it’s reflectivity. Not only will applying silicone coating to your roof be less expensive during installation, it will also save you money during its lifetime by being more reflective than most other coating applications. Let’s look at how a reflective roof coating can benefit your operations and save you money on your energy expenses. 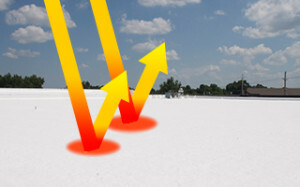 A reflective roof coating keeps your building cooler in the summer. Having a reflective roof means the sun doesn’t heat your building as intensely as it would if you had a traditional roof (although in some cases people want the sun to heat their building). Many building owners have understood this concept and have started to paint their roofs white rather than the traditional black or brown, but white paint is not nearly as reflective as a silicone roof coating. Yes, a white roof is better than a dark colored roof, but paint isn’t designed to be reflective, it’s just white. Our silicone coatings, however, are formulated and designed to reflect the sun; it isn’t just something they happen to do, they were meant to do it. For most roofs, the sun beats down on them in the summer and they absorb this heat. The heat is transferred inside the building, and the interior of the building becomes very hot. This means the building’s AC unit has to run extra long and hard just to keep the building cool. Even with the AC running, the buildings are usually still hot. Install a reflective roof coating over this same roof on the same building, and you will instantly see a decrease in the interior building temperature, simply by not absorbing the UV rays through the roof. This can lead to energy savings by up to 30% in the summer, which is a major selling point for building owners looking to reduce their spending. A truly reflective roof is far more effective than a roof that has simply been painted white. Call us today to learn about how our reflective roofs can help you stay cool and save money.